An ongoing fight over a storied Manhattan landmark proves that indeed, size does matter. 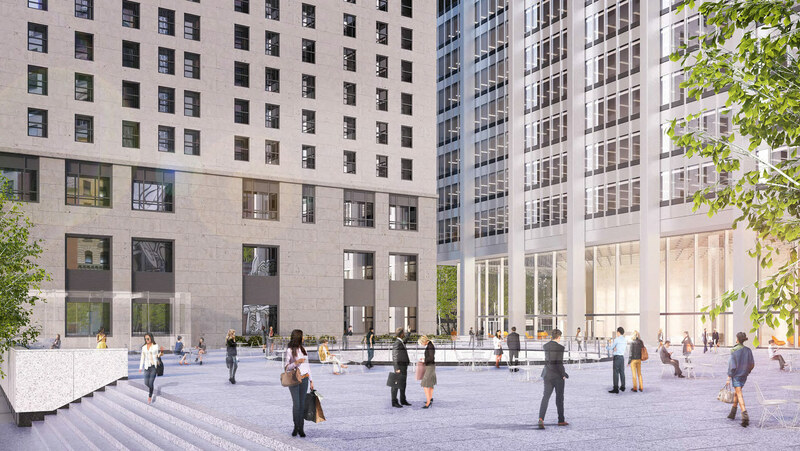 Fosun International, the Shanghai-based owner of lower Manhattan’s 28 Liberty Street (formerly One Chase Manhattan Plaza), has commissioned Skidmore, Owings & Merrill (SOM) to revamp its own classic, 1960s International Style building and 2.5-acre plaza. Among its planned changes to the site, Fosun received Landmarks Preservation Commission (LPC) approval to build three glass pavilions on the landmarked plaza to serve as entrances to below-ground retail. Although the commission approved the scheme, implementing changes at 28 Liberty requires an additional—and contentious—next step. Fosun is seeking a modification of 28 Liberty’s deed restriction that would allow the pavilions to rise 11 to 17 feet above the highest points of the plaza, heights that far exceed the deed restriction’s stipulation that structures on the plaza shouldn’t be more than six feet tall. SOM is updating the tower’s office space and plaza by reintroducing original details lost in prior renovations while transforming approximately 290,000 square feet of basement space into retail. The developers maintain that the glass pavilions are a key part of the renovations. Fosun argues that the three pavilions will improve handicap accessibility to the stepped plaza as well as protect shoppers entering and exiting the retail spaces from inclement weather. The pavilions, along with glass storefronts along Liberty and William streets, are intended to activate street frontage and encourage more fluidity between indoor and outdoor, below-grade and street-level spaces of the plaza, and sidewalk and tower. Although some later modifications imitate original conditions, all of the plaza’s elements are non-original aside from the Isamu Noguchi sunken garden. (The black-and-white Jean Dubuffet sculpture, installed 1971, was not included in the landmark designation.) The space is not a privately owned public space (POPS), but remains open to the public nonetheless. Not all New Yorkers are thrilled with the changes. Some members of Community Board 1 (CB1), one of the city’s 59 local representative bodies, say the design and the deed restriction, although technically unrelated, cannot be considered independently from each other. They point to the scale of the pavilions as proof: According to plans filed with the Department of Buildings, the three proposed pavilions include a 17-foot-tall, 46-foot-long, 1,473-square-foot structure at the corner of Nassau and Liberty streets; another 16-foot-tall, 43-foot-long, 1,132-square-foot structure facing Pine Street; and a third 11-foot-tall, 18-foot-long, and 418-square-foot structure at Cedar Street. The cubes’ sizes are not the only points of contention. Some residents think the architects’ renderings suggest the cubes are being rendered too transparently (a common offense in renderings), and that the built structures will impede sightlines on to the plaza, especially to the Dubuffet and Noguchi pieces. “Depending on light and structural angles, a glass cube can be quite reflective. At most angles, glass cubes are pretty transparent, but they are not like a window, they’re totally going to interrupt the view,” said Michael Ludvik, glass engineer and founding principal of M. Ludvik Engineering. SOM’s glass pavilions have been compared to the Apple Cube, which is not entirely accurate, Ludvik said. The Apple Cube is not made of anti-reflective glass, so when viewed from an angle, it can look almost opaque. To make the proposed pavilions as transparent as possible, he suggested using the thinnest and clearest glass available, along with appropriate fins, to minimize impact on clarity. SOM could not be reached for comment on the glass choice, but a spokesperson for the developer explained that it is not far enough along in the process to have made a materials choice. Blank’s concerns mirror public outcry over the recent Rivington House scandal, in which the city lifted a deed restriction that mandated the property be used as a healthcare nonprofit, a move that allowed the owner to profit handsomely from the sale of the property. In response, Mayor Bill de Blasio has announced a series of reforms to the deed modification process that could impact the dealings at 28 Liberty in the near future. Faulting “a process that has failed to protect and preserve significant community assets, like Rivington House,” councilmember Margaret Chin, whose district includes 28 Liberty, along with Manhattan borough president Gale Brewer, favor a process that would make deed restriction changes subject to a rigorous public land use review. Judgment day for the plaza is near if the city can agree on how, exactly, to process deed change requests. Right now, the mayor’s office is forging ahead with rules for the Department of Citywide Administrative Services (DCAS) that would provide clear guidelines for changes to deeds.In parallel to the mayor’s office, sources tell AN the city council could vote soon on legislation that would create a more rigorous public review than the mayor’s rules. Although the board’s decision is purely advisory, in October CB1 voted in favor of council-led deed change reform. Pittsburgh is slowly, and fitfully, reappraising its modernist legacy of corporate towers, postwar infrastructure, and neighborhood-obliterating “urban renewal.” In this complex and frequently polarizing narrative, the role of landscape is perhaps only now being properly addressed in academic and political discourse regarding the past, present, and future potential of communal civic space. Mellon Square was the first modernist urban park situated above a subterranean parking structure by Mitchell & Ritchey. Fifteen years earlier, Dahlen Ritchey, a Carnegie Tech and Harvard alum, had assisted Walter Gropius and Marcel Breuer on their luxurious Frank House in Pittsburgh’s Squirrel Hill. The main design heroes of Rademacher’s book are John O. and Philip D. Simonds, Pittsburgh landscape architects and environmental planners. 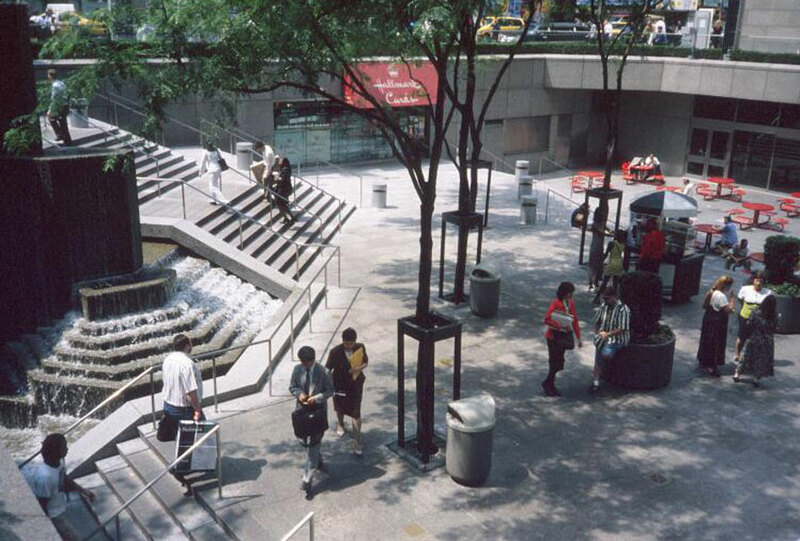 John, also a GSD man, published his seminal Landscape Architecture shortly after Mellon Square’s completion in 1955. Other key figures in Pittsburgh’s “renaissance” include then-Mayor David L. Lawrence (a Democrat), Richard King Mellon (a Republican), and Edgar Kaufmann. Kaufmann not only engaged Frank Lloyd Wright to imagine fantastical infrastructures at the juncture of the Allegheny and Monongahela rivers, he also commissioned a master plan titled Pittsburgh in Progress from Mitchell & Ritchey. Displayed at Kaufmann’s Department Store, a mere block from the future Mellon Square, this Corbusian-inflected plan heralded an urban agenda for the 1950s, radiating back from that historic origin of the city. Indeed, there are three Harrison & Abramovitz-designed landmarks for Mellon-related businesses in the immediate vicinity: the sober U.S. Steel/Mellon Bank Building, the innovative Alcoa Building directly overlooking the square, and later, the U.S. Steel headquarters, a towering paean to weathering steel at the intersection of Pittsburgh’s two urban grids. Disliking the orthogonal paving proposed by Simonds & Simonds, Sarah Mellon Scaife’s fondness for St. Mark’s Square led to the harlequinade pattern that brings Mellon Square its graphic elegance, especially when viewed from the surrounding towers. Inevitably perhaps, some problems ensued—with tiles, flower beds, and wiring—eventually, “the main fountain and lighting no longer worked.” According to Rademacher, “despite efforts (…) continued maintenance did not remain a priority”. It was not until 2007 that the Parks Conservancy, then the guardian of Pittsburgh’s verdant sequence of robber baron-era parks, got involved. In 2008, the Conservancy published its Mellon Square Preservation, Interpretation and Management Plan. Soon, a planning team was in place, led by Patricia M. O’Donnell of Heritage Landscapes. Mellon Square: Discovering a Modern Masterpiece goes into considerable detail on both the birth and now the rebirth of this important mid-century landscape set in a city that is itself experiencing economic and social renewal. The book may be slim, yet it is packed with information—a slight drawback of its dimensions is the small size of many illustrations. Rademacher has performed a service for Pittsburgh and for other U.S. cities unwilling to jettison the recent past and the timeless value of offering, “a place of pure delight—an inviting refreshing environment,” to quote Simonds. Vornado Realty Trust, one of New York City's biggest landlords, has just released renderings from New York–based Kenneth Park Architects (KPA) that reimagine the streets surrounding Penn Station and Madison Square Garden. While Snøhetta was tapped last year to master-plan the area, other firms have been hired to supplement Snøhetta's work. Vornado commissioned KPA to master plan the 1,270,000-square-foot area, which is now a chaotic blast of commuters, ambling tourists, vehicle traffic, and dense street-level retail that sees some of the heaviest pedestrian traffic in the city. 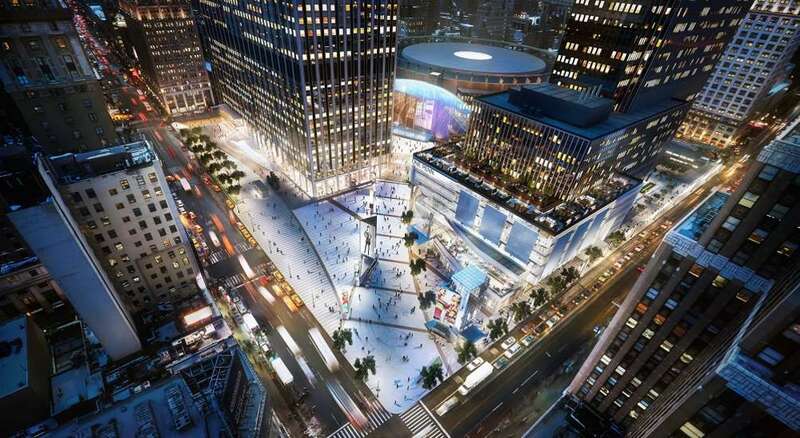 Renderings suggest that redevelopment will reposition retail, bring the plaza improvements to-grade, and funnel foot traffic to and from Madison Square Garden at a diagonal midblock. The plaza is intended to compliment Vornado's One and Two Penn Plaza, the conjoined 4.2 million-square-foot office complex. 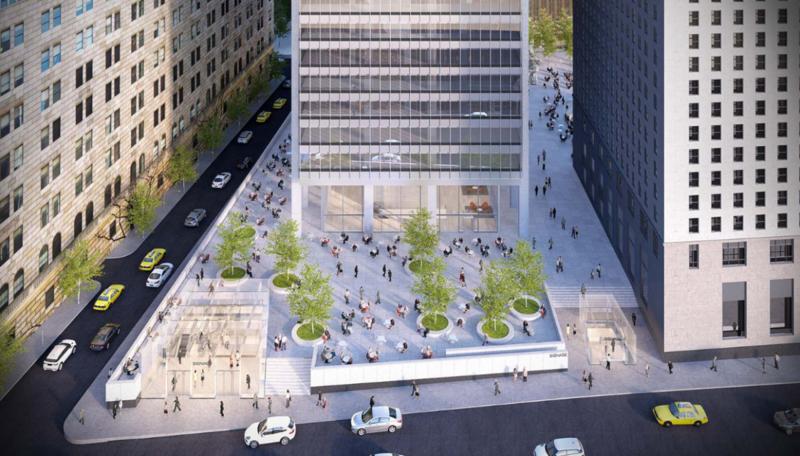 Two Penn Plaza, with its frilly glass-and-steel petticoat, will be designed by BIG. Along with the city and the 34th Street Partnership, VNO is working to revamp public spaces. Last year, the developer brought in W Architecture & Landscape Architecture to design Plaza33 on 33rd Street between 7th and 8th avenues. 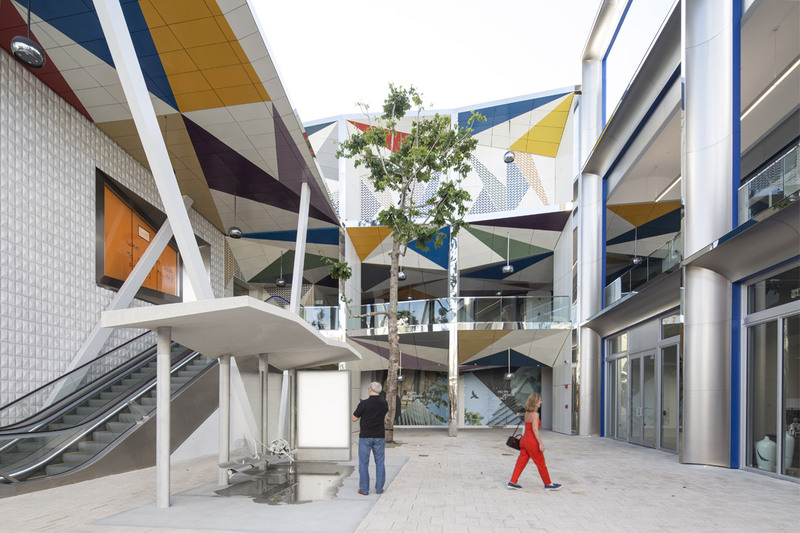 The pilot was extended this year with new landscaping and a colorful painted street. Update 7/27/16: CB1 voted yesterday to table the resolution modify the site's deed restriction to allow for more public review of the proposal. To demonstrate the proposed changes for the public, a tour of the site will be offered. The tour is provisionally scheduled for early September 2016, before CB1's Financial District Committee's follow-up meeting on the issue. In lower Manhattan, some residents fear that SOM's take on a classic SOM design will compromise the character of one of the city's best-known International style plazas. The addition of the entry pavilions will change the integrity of the original design of this celebrated plaza; they will compromise three of the neighborhood’s important view corridors; they will act as beacons of commerce day and night and will significantly increase pedestrian foot traffic in the area. These are major changes with major consequences for the community. Blank, who is a CB1 member but does not represent the board in her advocacy around this issue, went on to condemn the renderings as misleading. "The structures have been rendered so diaphanously as to risk leaving the misleading impression that the addition of 3 large structures on top of this classic modernist plaza, will have little visual impact or aesthetic consequence." The changes will enhance the plaza and bring key elements back to their original condition, countered SOM associate director Frank Mahan. "No one has a greater vested interest in doing right by this building than SOM. 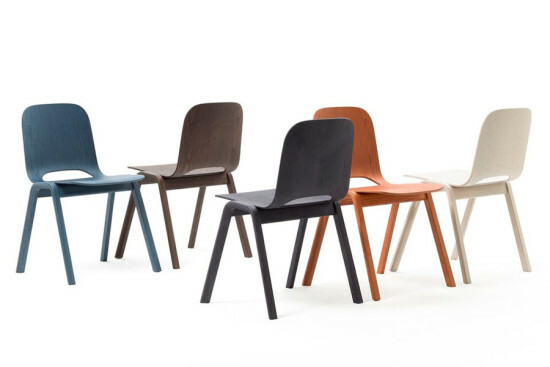 It's important to be good stewards of classic work." Mahan called the cubes in question "minimal and transparent," noting that they "will impact the existing architecture in a minimal and appropriate manner." Adaptively reusing the basement enables restorative measures like reinstating the parapet that once encircled the plaza, cleaning and restoring the Noguchi sculpture on-site, and eliminating non-original air intakes on the plaza's north side, he explained. Modifying the site's deed restriction clears the way for the proposed development. When reached for comment, Blank noted that if the deed is modified the return on investment for Fosun is high, and the public should have additional opportunities to weigh in on whether these changes offer an equitable exchange. For those wishing to weigh in tonight, CB1's meeting begins at 6PM in the DC37 - Auditorium at 125 Barclay Street. The NYC Department of Design and Construction (DDC) and the NYC Department of Transportation (DOT) recently unveiled the redesigned, ultra pedestrian-friendly Fordham Plaza. Vision Zero's mandate to reduce traffic-related injuries and fatalities guided the $34 million renovation of the north Bronx transit hub. 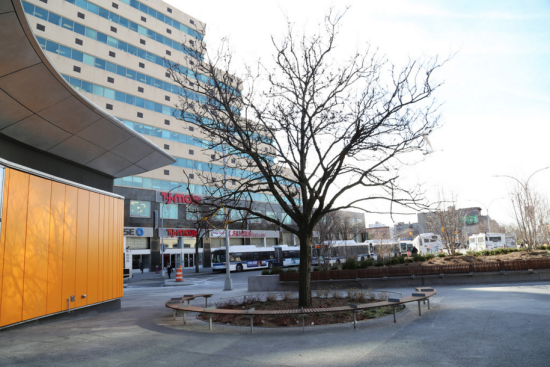 Bounded by Webster Avenue, East Fordham Road, and East 189th Street, the Grimshaw Architects–designed Fordham Plaza now boasts fresh plantings, as well as stationary and movable seating elements to provide a respite for the nearly 80,000 pedestrians per day that travel along Fordham Road. 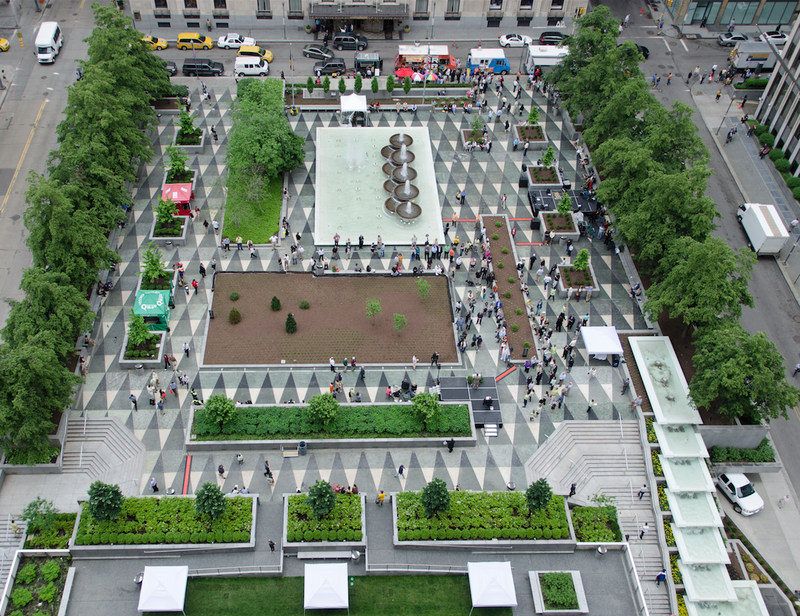 True to the plan released in 2014, the plaza features a new market canopy, kiosks, a cafe, and—rare for New York—a public toilet. 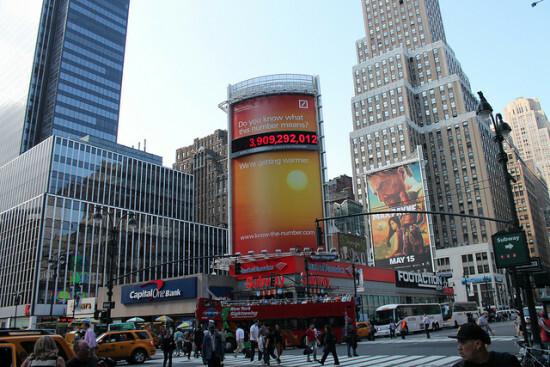 The redesign was carried out in collaboration with the NYC Plaza Program, a NYC DOT program that has spearheaded the creation of 69 plazas, 16 of which are in development or currently under construction. A 40 percent reduction in asphalt created more space, and more safety, for pedestrians at Fordham Plaza. The plaza now sports shorter pedestrian crosswalks, "direct" crosswalks that discourage jaywalking, and a 25 percent increase in pedestrian-only space. These interventions should improve access to Fordham University’s Rose Hill Campus, right across the street. Fordham Plaza primary program is transit: 12 local and express bus lines, as well as the fourth-busiest Metro-North station. Bus stops were redesigned to improve pick up, drop off, and the loop-around, especially around East 189th Street and Webster Avenue, that guides buses off towards Westchester County, Manhattan, and all over the Bronx. 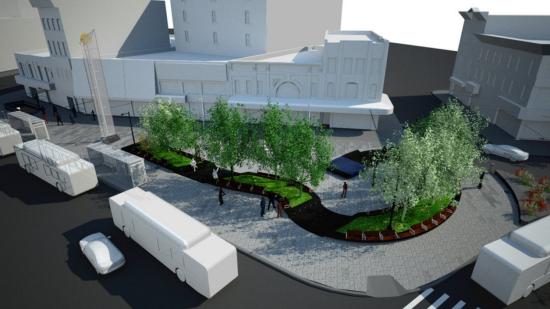 OneNYC Plaza Equity Program will provide the Fordham Road BID with funding to maintain the plaza. $10 million came from a U.S. Department of Transportation TIGER grant, and $2 million from the state Department of Transportation. "The Hub," in the Bronx neighborhood of Mott Haven, couldn't be better named: it's the center of commercial activity in the South Bronx, and one of the busiest intersections in the city. As its dense avenues are packed with shoppers and commuters, the city moved to expand and improve Roberto Clemente Plaza, a public space that's a respite from the hectic nearby streets. In 2008, the NYC Department of Transportation (NYCDOT) upgraded streets and public space in the area, improving walkability with 15,000 additional square feet of sidewalks, pedestrian islands, and streets partially reclaimed for pedestrians. As part of these improvements, the NYCDOT remade Roberto Clemente Plaza, at Third Avenue and 149th Street. Extra street space was repurposed into a temporary pedestrian plaza with the addition of paint, planters, and gravel. In 2010, NYCDOT passed the torch to the NYC Department of Design & Construction (DDC) Design Excellence Program to create a permanent Roberto Clemente Plaza. The DDC partnered with Brooklyn-based Garrison Architects to design the plaza. Renderings show a curved green strip, lined with benches, that lets plaza visitors take in the streetscape. It's been over two years, however, since the project with an 18 month timeline began, and there's no firm end date in sight. The DDC estimates that construction will last through 2017 (though its website says construction will be complete by August 2016). Neighbors are furious. The constant construction has caused declining revenues for businesses bordering the plaza, and the ever-present construction equipment is an eyesore, residents and business owners claim. 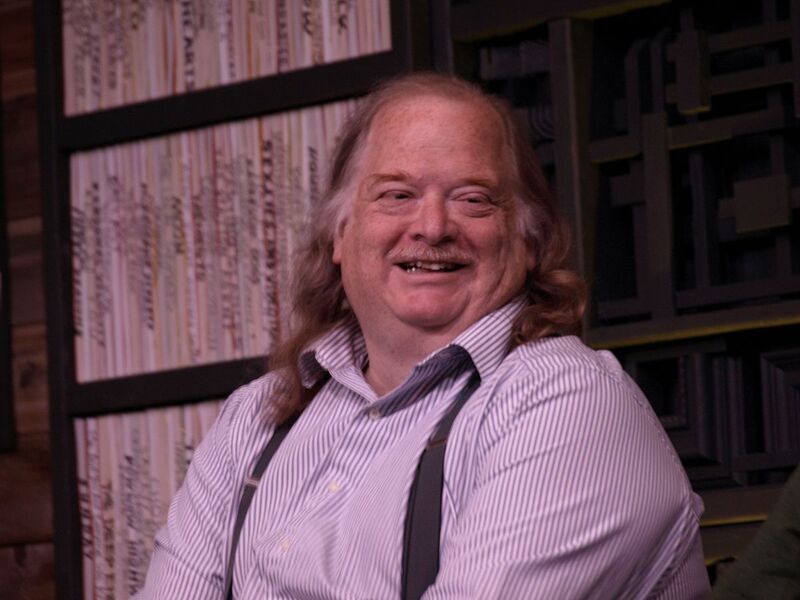 In conversation with Streetsblog, Third Avenue BID Director Steven Fish summed up the community's attitude towards the project. “General consensus is that this is a hellhole and there’s no end in sight.” The DDC claims to be "working diligently" with the contractor to minimize further delays. The frustratingly congested, obnoxiously loud, and aggressively dirty area around Penn Station is easily the worst part of Manhattan. It is the reason why tourists qualify their vacation stories about New York with "but I could never live there." Turning the dreadful area around the station (let's leave the hated station out of it for now) into a pleasant place where people want to spend time and not just push and shove their way through is a Herculean task, but one that Snøhetta has agreed to take on. Crain’s reported that Vornado Realty Trust, which owns most of the property around Penn Station, has tapped the high-profile firm to come up with a master plan to spruce up its adjacent buildings and street-level areas. Once that plan is finalized, Vornado may bring in other architecture firms to take on specific projects. But bottom line is that Vornado understands how miserable the area is right now. Mark Ricks, the company's senior vice president of development, called it the "collision of humanity." He gets it. To see how a more pedestrian-friendly transformation would shakeout, Vornado will be turning a one-block stretch of West 33rd Street into a public plaza from mid-July to mid-October. The new space could include tables and chairs, performances, and even yoga classes. StreetsBlog reported that other changes could be coming to 32nd Street as well including a sidewalk extension, planters, and eliminating one lane of traffic. Vornado will pay for all of the improvements, which should make the area a little less terrible and its property a little more marketable. 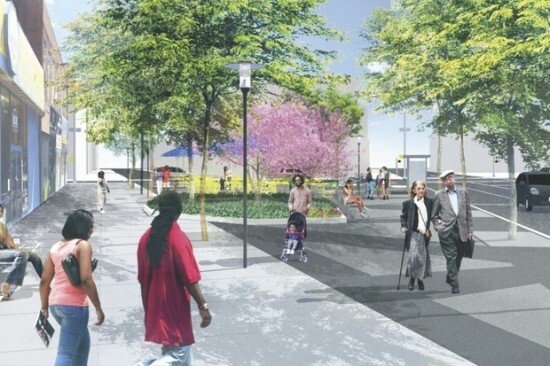 After years of planning and workshops, Brooklyn's Community Board 2 recently approved a redesign of Putnam Triangle Plaza in Clinton Hill. The $3.75 million project, led by Thomas Balsley Associates, will significantly upgrade and expand the existing plaza that opened in 2011. The new space comes with a gray geometric paving pattern, new lighting, benches, tables, chairs, and bike racks, along with twice as many plantings and trees. There will also be new space for public art and events. The green light for the project comes months after Thomas Balsley Associates presented four options for the site to community members. That was the final stage in the plaza's public review process that had become notably heated; some local stakeholders decried the current plaza and the expensive plan to expand it. DNAinfo reported that the project will be primarily funded by the federal Transportation Enhancement Program with money also coming from New York City's PlanNYC and some local officials. Construction on the plaza is slated to start summer 2016 and last about one year.